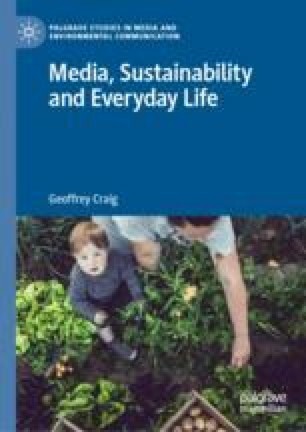 This chapter offers a definition of lifestyle media and it delineates the more specific concept of environmental lifestyle media. It explores the synergy that often occurs between lifestyle media and accompanying advertising. The chapter considers lifestyle media as popular media texts that both entertain and educate readers and viewers and it investigates the ways that environmental lifestyle media can at times both contribute to processes of democratisation and reproduce class divisions. The chapter provides discussion of how environmental lifestyle media are oriented around strategies of self-improvement and are examples of cultural governance. It also introduces the reader to the methodological approach adopted in the textual analyses of the case studies in subsequent chapters. Brook, Stephen. 2006. “Reuters Moves into Lifestyle Journalism.” The Guardian, June 1. https://www.theguardian.com/media/2006/jun/01/reuters.pressandpublishing. Sheppard, Kate. 2013. “The Heat Is on as the New York Times Closes Its Environment Desk.” The Guardian, January 14. https://www.theguardian.com/commentisfree/2013/jan/14/new-york-times-environment-climate-change.